Welcome to this week’s installment of our Thirsty Thursday blog. I haven’t blogged on a cultural beverage in many weeks, so I am happy to be back featuring a beverage that many of you have not heard of. This week’s featured drink comes to us from Scandinavia and is known as Akvavit. Let’s learn about this liquor and where it comes from. Akvavit or aquavit is a flavored liquor that is produced in Scandinavia since the 15th century. It is the most popular drink in Denmark and is also drank in Germany, England and parts of the U.S. with large Scandinavian settlements. It’s distinctive flavor comes from it’s main spice caraway. It is also made with cardamom, cumin, anise, fennel, lemon and orange peel, some varieties even include dill. It is generally 40% alcohol by volume and must have at least 37.5% alcohol by volume to be called Akvavit by the rules set by the European Union. This drink is very popular in Scandinavian culture. It is generally drank at weddings and holiday celebrations. It is an aperitif and generally sipped from a small shot glass accompanied by a dark beer. It is similar to vodka, as it is distilled from grains or potatoes. It is then flavored with the spices listed above. The earliest reference to Akvavit in Scandinavian culture comes from 1531. In a letter from the Danish lord of Bergenshus to the Roman Catholic Archbishop the lord references the archbishops illness with suggestions on the healing powers of Akvavit. Although these so called healing powers were a bit over exaggerated by the lord, it can aid in digestion, especially of rich foods. Which is why it is most often drank at large lunch meals on Easter and Christmas. Are you ready to try this beverage yourself? Time to call us here at Ambassador Travel today! Typically on Thirsty Thursday we feature alcoholic beverages, but I am making an exception today due to the fact that the history of this drink is pretty cool, especially to a geeky history major like me. If you’ve ever traveled to Europe or Germany specifically you may have been surprised at how much the people like Fanta, and there is a very good reason for that. Let’s crack a bottle of this orangey drink and learn about it’s interesting past. Because of the embargo on Germany during World War Two, Germany’s Coca-Cola production went into a stand still. They were not able to receive the syrup needed to produce Coke. This lead Max Keith, Head of Coca-Cola Deutschland, to come up with a plan. He decided that his corporation needed to put out something that Germany had access to. And thus Fanta was born. The drink was so popular that 3 million cases were produced between 1940 and 1943 allowing the factory to stay open during the remainder of WWII. After the war ended, Coca-Cola took back control of the German corporation as well as the profits and Fanta recipe. The drink was originally marketed heavily in Europe, Asia and South America, but eventually came over to the United States. If you have ever had it in Europe you know it is much less orange than it is in the United States. Obviously you can get this beverage here, but don’t you want to try this drink in it’s native country? I knew you did! So give us a call today! So if you are a lover of our blog you may recognize this drink because we have featured it before, but this article is pretty cool about the history of Brazil’s Caipirinha. Shout out to Travel Planner Brittany for sending me this cool article that I can share with all of our followers. Happy thirsty Thursday everyone, check out this article and let the flavors of Brazil inspire your next destination! Intersted in trying this beloved cocktail? Want to know more about Brazil? It’s time to call us here at Ambassador Travel Ltd. Cheers to Thirsty Thursday! 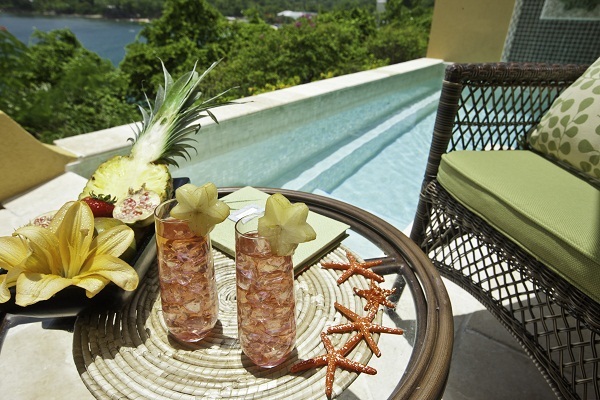 Today we are going to look at creating a signature cocktail for your destination wedding. Being a soon-to-be bride myself, I think adding personal touches to a wedding is one of the best parts of planning. And although I am not doing a destination wedding, I would imagine that the personal touches are a lot less than they would be if you were planning a traditional wedding, so having options like a signature drink is a great way to bring your personality into it. Sandals, in my opinion, really does the whole destination wedding thing right. Going into it you know that they have a lot of options for couples when they have a name just for their destination program. WeddingMoon allows you to pick your flowers, cake, theme, colors and much more. Sandals basically uses an online wedding planning system to make planning your wedding simple, and completely stress free. Now lets get back to the drink. Signature drinks have become just as common at weddings as horrible bridesmaid dress. They stand out, often come with kitschy names and really help your guests to feel a part of your big day. With my own wedding we offered a signature cocktail at our engagement party called “broken mirror beer,” obviously to an outsider they would have no idea what this had to do with. But to our close friends it was a funny reminder of the first night me and my fiance met when I broke the mirror in his bathroom on accident. Special touches on an even more special day make all the stress and planning worth it and I think doing that in anyway whether that be a signature drink, or a memory box or a million other things can help you achieved the goal of that day. A marriage is about two people, but a wedding is about celebrating with the closest people in your life and for one day making that marriage about them as well. Sometimes going into Thirsty Thursday I am here to debunk what are thought be cultural drinks, and are simply American made with fancy names. Today is just that day. On a regular (daily) basis I learn so much about what I am writing about. Today again is one of those days. I thought I would continue our Russian theme this week by featuring a White Russian. I was hoping to find out that this popular creamy beverage had a rich culture in the Motherland, but I was sadly mistaken. White Russians consist of vodka, coffee liqueur (most popularly Kahlua), and cream or milk. This came out of the popular drink the Black Russian in 1949 in the United States. A White Russian is a Black Russian with creme. Neither have anything to do with the former soviet state, they are just named Russians because their primary ingredient is vodka. Shake well with ice, strain into chilled Old Fashion glass, sip and enjoy.